This document introduces the localization features of the Android SDK and how to access them with Xamarin. This section describes the main localization features of Android. Skip to the next section to see specific code and examples. Users choose their language in Settings > Language & input. This selection controls both the language displayed and regional settings used (eg. for date and number formatting). var lang = Resources.Configuration.Locale; // eg. "es_ES"
This value will be a locale identifier that contains both a language code and a locale code, separated by an underscore. For reference, here is a list of Java locales and Android-supported locales via StackOverflow. Android generates android.intent.action.LOCALE_CHANGED when the user changes their language selection. Resource folders to contain localized strings, images, and other resources. @string/id in AXML files, to automatically place localized strings in layouts. layout - contains AXML layout files. drawable - contains images and other drawable resources. raw - contains data files. Most developers are already familiar with the use of dpi suffixes on the drawable directory to provide multiple versions of an image, letting Android choose the correct version for each device. The same mechanism is used to provide multiple language translations by suffixing resource directories with language and culture identifiers. When specifying a top-level language like es only two characters are required; however when specifying a full locale, the directory name format requires a dash and lowercase r to separate the two parts, for example pt-rBR or zh-rCN. Compare this to the value returned in code, which has an underscore (eg. pt_BR). Both of these are different to the value .NET CultureInfo class uses, which has a dash only (eg. pt-BR). Keep these differences in mind when working across Xamarin platforms. A localized values directory (eg. values-es or values-pt-rBR) should contain a file called Strings.xml that will contain the translated text for that locale. With the strings files set-up, the translated values can be referenced in both layouts and code. "There is 1 task left." "There are 2 tasks still to do." (rather than a generic "There are n task(s) left"). To render the complete string use the GetQuantityString method, passing the resource ID and the value to be displayed (which is passed twice). The second parameter is used by Android to determine which quantity string to use, the third parameter is the value actually substituted into the string (both are required). They're described in more detail in the Android docs. If a given language does not require 'special' handling, those quantity strings will be ignored (for example, English only uses one and other; specifying a zero string will have no effect, it will not be used). Localized images follow the same rules as strings files: all images referenced in the application should be placed in drawable directories so there is a fallback. Locale-specific images should then be placed in qualified drawable folders such as drawable-es or drawable-ja (dpi specifiers can also be added). 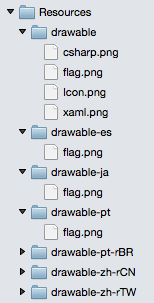 In this screenshot, four images are saved in the drawable directory, but only one, flag.png, has localized copies in other directories. You can also provide other types of alternative, language-specific resources including layouts, animations, and raw files. This means you could provide a specific screen layout for one or more of your target languages, for example you could create a layout specifically for German that allows for very long text labels. 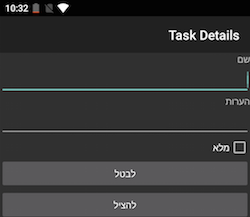 Android 4.2 introduced support for right to left (RTL) languages if you set the application setting android:supportsRtl="true". The resource qualifier "ldrtl" can be included in a directory name to contain custom layouts that are designed for RTL display. For more information on resource directory naming and fallback, refer to the Android docs for providing alternative resources. Android 4.2 and newer provides full support for RTL layouts, described in detail in the Native RTL Support blog. When using Android 4.2 (API level 17) and newer, alignment values can be specified with start and end instead of left and right (for example android:paddingStart). There are also new APIs like LayoutDirection, TextDirection, and TextAlignment to help build screens that adapt for RTL readers. RTL text is localized using Strings.xml files in the same way as LTR text. Make sure to thoroughly test the default locale. Your application will crash if the default resources cannot be loaded for some reason (i.e. they are missing). Refer to Google's Testing on an Android Emulator section for instructions on how to set an emulator to a specific locale using the ADB shell. To test on a device, change the language in the Settings app. Tip: Make a note of the icons and location of the menu items so that you can revert the language to the original setting. This article covers the basics of localizing Android applications using the built-in resource handling. You can learn more about i18n and L10n for iOS, Android and cross-platform (including Xamarin.Forms) apps in this cross-platform guide.